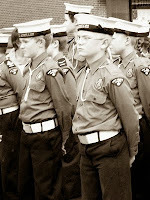 May 2, 2010 : Today my son Sam marched in the memorial parade for the Battle of the Atlantic. Sam is a Navy League Cadet (cadets for the 9-12 set). 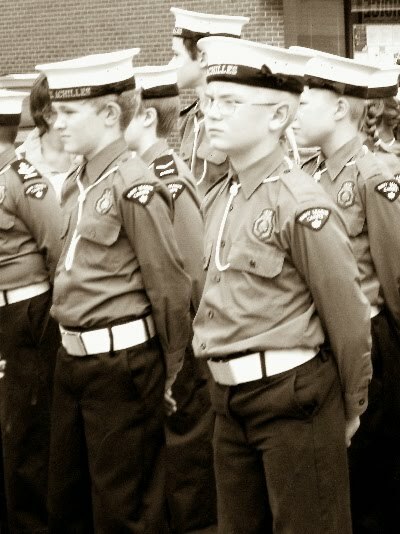 He is very proud to be a cadet and keen to do ceremonial parades. Both his paternal grandparents, neither of whom lived to see their grandson, were in the Navy. His maternal grandfather -- my dad -- was in the Navy and took part in the Battle of the Atlantic. To hear my father talk, all he did in the Navy was throw up. "I was sick every day I was at sea," he'd say. 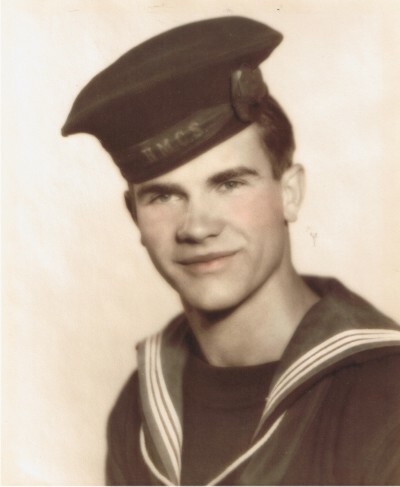 That was when he was serving on the HMCS Stratford, a mine sweeper serving in the Gulf of Saint Lawrence. Until I was grown up and reading about the history of the period, I had no idea how rough the seas were -- that almost as many ships were lost to weather as mines and U-boats. They didn't teach us in school that the German u-boats invaded Canadian waters, or even how important it was to the war effort to keep the seaway safe. The Battle of the Atlantic was the longest running battle of World War II. Britain would have fallen if not for the steady supply of food, equipment and arms from Canada and the United States. Halifax and Sydney Nova Scotia were the marshaling points for American and Canadian merchant ships carrying these goods. They sailed in convoys, guarded by naval destroyers and corvettes. By the end of the war, most of those ships were Canadian. From my father's point of view, the danger of being blown out of the water was outweighed by whether or not he could keep his breakfast down. So he made it seem and maybe that's how he felt. 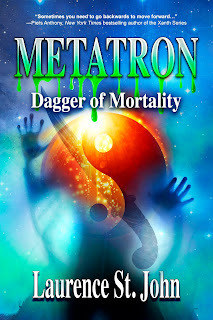 He was barely out of his teens and death didn't worry him nearly as much as discomfort. The memories he shared were mostly about what he did on land, not at sea. Foremost, he fell in love with the maritime provinces, especially Newfoundland. Apparently, he also fell in love with a member of the WRCNS (Women's Royal Canadian Naval Service). But I only know about that because of a photo and a telegram I found with my father's effects. He met one of his best and life long friends in training, Reg Bennett. Dad never talked about training except to say he wasn't fond of the physical parts. Reg filled in a few gaps describing my father as one of those infuriating types that would seem to doze off in class and them give the right answer when questioned. That jibes with the man I knew. He would tell stories about being on leave -- like seeing the "Scottish Play" in Scotland. He and his friends had been out drinking beer before the play started, and there were these artificial plants... then he'd remember he was supposed to be a good example to the children. Other than being sick, he only spoke of his downtime onboard. On one ship they had Sterno stoves and would fry-up egg-in-the-hole, boil coffee or warm up a can of beans. This was when he was posted to a cruiser, I believe. (Dad tended to jump around in his stories.) After the mine sweeper, the cruiser was smooth sailing. Because of delays in outfitting, it made it into the Pacific just behind the major engagements that culminated in the surrender of Japan. All this nostalgia is not entirely the fault of the memorial... at least not today's memorial. In the twenty-four months since then, I have been finding clues to my father's life BC (Before Children). I grew up with my Dad and lived with him (more or less) the last eight years of his life. I see him daily in my own son. But I wish he had told me more about his Navy career (I asked often enough) and even more, I wish he could have told Sam. What a wonderful tribute to both your father and your son! My parents both served during WWII. Don't regret not asking your father more about his war-time experiences. Most veterans, for reasons we can't fathom from our safe perches, refuse to talk about those troubled, tragic, traumatic times. Theirs is a pain, we will never share--and that is exactly what they want. You are so right, Eileen. A friend of mine, whose father was a ship builder in Scotland during the war, never talks about the war only the funny little things that happened. I just thought, Dad's second ship was built in Scotland. That's why he was there for the play. I should mention that to her.